Vince Most Wanted of Wartime Music and Faranhite of Playa Like Individuals Dropping Their Collaborative Album “Rise of the South” January 15, 2013!!!! Breaking the Labels is proud to announce the COMING of the “Rise of the South” – a prolific Hip Hop music collaboration on the parts of Vince “Most Wanted” Bryant and Farand “Faranhite” John. The two are leading a project that is set to bring Southern Hip Hop back to the age of the Ghetto Boys and the Pimp C’s that we loved so much. Rise of the South is set for world-wide digital music and video distribution through BreakIt! Distribution. The project is setting the tone for other artists to step up their game. It’s time to give the people better quality music, more selections and a balance. “Rise of the South” is as invigorating as its title! It’s going to infuse the community with a sense of ownership and power when it comes to getting what they want from the Entertainment community! No, this project is not about preaching a message, although there is a great message behind it all! This album will give us something to ride to and think about, all at the same time! With dynamic track selections by The BEAsTMASTER!, G-Hizzle, BLACSMITH and Young B. Seale, the people are going to get an explosion of hot music and lyrics. Listening sessions have already proven the project is attractive for all age groups! Today, June 16th marks the birth of a genius, a hip hop warrior and martyr in this industry, Tupac A. Shakur. Since Tupac’s death, many artists have long forgotten his passion in this industry, forgotten what it was to give truth and a message that made you wanna rock to it and blast it through yo’ speakers. So it is only right that this day, we mark the RISE – the “Rise of the South.” We shall rise again, back to that culture we once were, that culture that allowed us to have creative balance, thought and demand! Individuals assisting with “Rise of the South” are Martell “Sir Tell” John of PLI Global Enterprises, Vanessa Chozen Marie of Breaking the Labels and BreakIt! Distribution, Timi F. John of PLI Global, Jeffrey “The BEAsTMASTER!” McNeil of Soul Math Entertainment and BreakIt! Distribution, Gerald “G-Hizzle” Hill of PLI Global, Douglas “Young B. Seale,” of Area 57 Recording Studio, Bruce “B.McKinzy Photography” McKinzy, Etienne Coleman, Ajali Funches of Ajali Entertainment, Deep Freezz of Deep Freezz Productions and Sam Shaw. 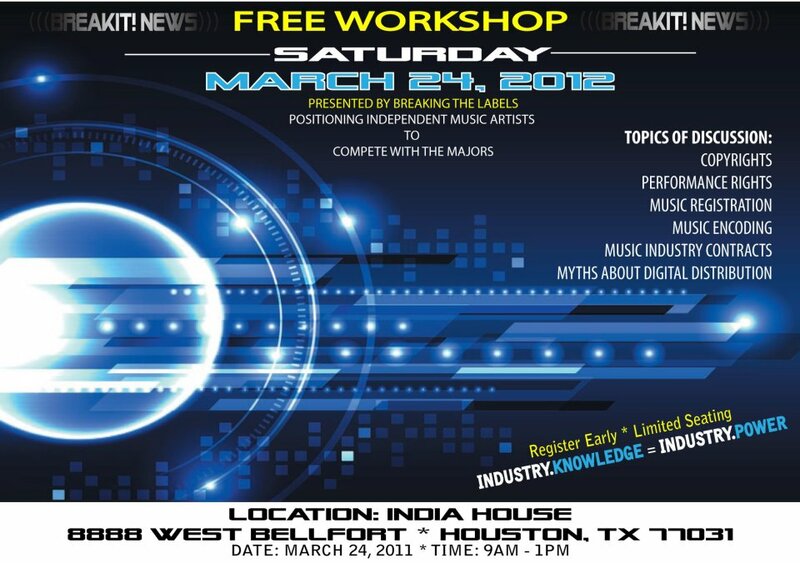 Houston “WE HAVE A PROBLEM” Breaking the Labels is hosting a FREE MUSIC INDUSTRY WORKSHOP/SEMINAR in the HOUSTON AREA… Damn what are these promoters gonna do now when you become more educated about the game. BreakIt! Distribution is proud to announce its signing of Vince Bryant. Bryant has proven to remain true to Hip Hop as well as his country, serving 2 terms in Iraq preceding the tragedies of 9/11. It is only fitting that he embark upon another war, the Hip Hop Revolution, on the same day that he was boarding a flight to Camp Pendleton, when tragedy struck America’s peace and infrastructure on a mass level to engage in Marine Combat Training for the battle to come. Some decide at some point in their lives, they have a love for music some decide they have a talent for music. Some, such as Vince Bryant are chosen for the music industry, to lead a culture — born and delivered into it like a breech baby feet first, landing firmly on the ground. On November 20th, Leo and Lilla Bryant birthed the most spiritual MC into a strange land to represent as the chosen. Bryant is presently the most versatile artist in the Houston area — acting as a vocalist, song-writer, producer and lyricist, he has the ability to sing and rap comparably. Developing his drive and talent in the house of the Lord at the age of only 5 years old, Bryant was mesmerized and intrigued by the sound of his own voice, realizing he was blessed with a natural gift of music. He ventured and explored various genres and styles of music to test his skills. In 1985, Bryant took his career to another level, creating his own style of Hip Hop inspired by some of the most successful pioneers in the industry such as Whodini, LL Cool J, KRS1, Rakim and Public Enemy. Already established as a well-known producer himself, Bryant encountered producer Jeffrey Sadik McNeil in 2002. After their meeting the two inspired a major catalog of songs together blessed by the instant connection of their talents. Bryant’s inexorable rhymes and Sadik’s impervious beats cultivated a style of Hip Hop never delved upon in the community and proved to be intergalactic in reach. In 1998, Vince Bryant was the first North-side artist to be recognized as a professional artist from the North-side, on DJ Screws 1998 mixtape release Outlaws. During a time when North-side and South-side Houston were not showing love, unless regionally, this was a huge accomplishment and solidified the beginnings of peace amongst the feuding sides of town. In 1999 Bryant a.k.a. the Bishop, at the time, began performing in the Houston area gaining notoriety throughout and today is one of the greatest underground artists in Houston. Bryant released his first mixtape in 2005, titled, “Interview With A Veteran” while serving in the United States Marine Corps in support of Operation Iraqi Freedom soon to be followed by his debut album titled “Sadik McNeil Presents: Vince Bryant’s Greatest Hits Vol. VII.” Properly noted Sergeant Bryant, Bryant’s background as a U.S. Marine Combat Veteran, lyricist in the music industry, and a juvenile detention center drill instructor has culminated a diverse partnership in the vision to make drastic changes in the music industry and communities world-wide. 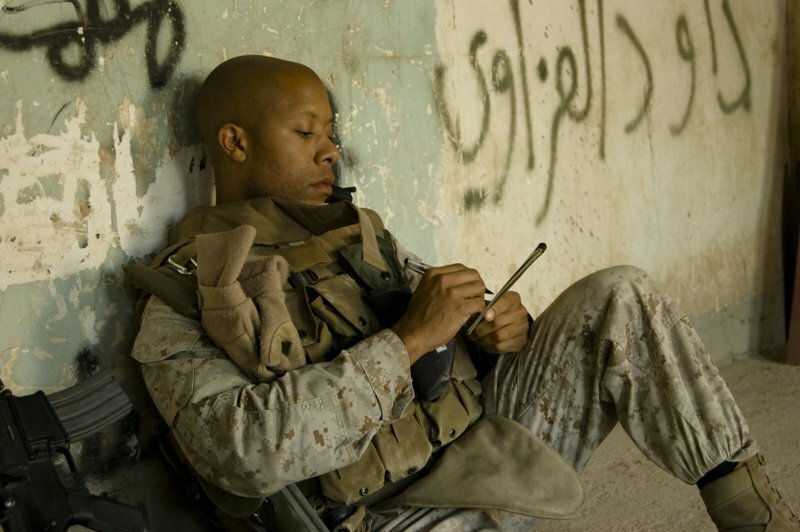 His battle overseas to afford a country privileges and freedom, we at times take for granted, has never ended. He is now fighting a realistic battle right in the US to reach youth through the most miraculous influence known to them… MUSIC! BEHOLD I RETURN The Resurrection of Vince Bryant — Americas chosen! The wait is now OVER! This is just the beginning of taking the GAME back… All you lame characters betta step out the way cause we came to lay you down!!!! 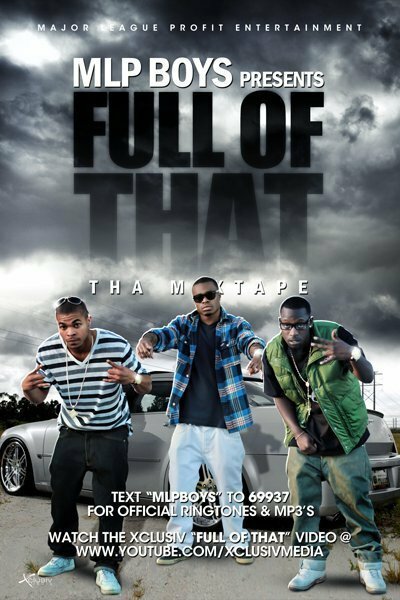 King Micheal Walls aka Mr. Mike, Vince Most’Wanted, Chozen and Young B. Seale…. they ain’t ready for this!!!!!!! I don’t even get on tracks like this anymore… but you can’t deny a real collabo!!!!!! Stay tuned for more!!!!! 97.6 BreakIt! Radio is continuing to make waves in the entertainment industry; artist such as the MLP Boys (JC (Marshal Ekwuruke), Lil Red (Chris Ekwuruke), and YT Moe (Jeremy Moore)) are taking the name of 97.6 BreakIt! Radio with their Exclusive Park Promo into the community and across the nation. Feeding the hunger of Hip Hop fans across the East Texas area is how these three Major men started there love for the music. Fusing New school with Old school flavor. Without fail they are pushing this force across the nation, supplying the demand for Fresh Style and Culture in the game; they affiliate with great DJ’s, such as DJ JCof. These artist use their hypnotizing rhythm to not only draw a crowd to groove, but also to give back. MLP Boys (Major League Profit) are not here for a fling with Hip Hop, not here to “change the game;” taking a strong stance to revive it fully!